North Simcoe offers businesses of all sizes ample opportunity to prosper. Check out these real-life examples of businesses that have found success in our region. Ambient Activity Technologies, based right here in Midland, has developed ‘ABBY’, a non-pharmaceutical, activity-based approach to managing responsive behaviours in persons living with moderate to severe levels of dementia. ABBY helps to manage responsive behaviours by providing opportunities for residents living with dementia to self-initiate, engage and interact with personalized stimulation experiences that are familiar and meaningful, to attain a state of calm. ABBY’s ability to manage responsive behaviours was assessed in six Long-Term Care homes across Ontario. In a study conducted by the University of Toronto over an eight-month period in 2017, a variety of outcomes, including resident aggression, agitation, depression, cognition, use of anti-psychotic medication, as well as staff strain and family/visitor satisfaction were measured. Please visit Ambient Activity Technologies and download the evaluation report. Bulbs of Fire is a garlic farm located in the Township of Tiny, just west of Awenda Park. Founded by Bart and Simone Nagel, the farm specializes in heirloom garlics with a special interest in hot varieties. Garlic wasn’t really the plan when the Dutch couple moved to Canada in 2006. But people expressed interest in the handful varieties Nagel grew for personal use. When he decided to grow a bit more, he discovered a fast growing niche market. Foodies and consumers who aspire to eat local, now crave Bulbs of Fire’s exceptionally tasty garlic. The farm has grown fast. In merely four years, Bulbs of Fire has planted over 35 varieties and around ten times the amount of garlic of the startup year. The farm sells its gourmet garlic online to gardeners all over Canada who look for heirloom seed garlic. Bulbs of Fire also sells though a subscription model, at farmers' markets and to local restaurants. Bulbs of Fire is particularly known for smoked garlic, a true delicacy with many applications. Besides garlic, the Nagels raise heritage poultry, quail and rabbits. All of which contribute to a healthy garlic crop with excellent manure. What started as a hobby farm geared towards a more self sufficient life, has become business based on a passion for tasty local food, and a rural, self sustaining life. Healthcare Expansion: A youth wellness hub, offering walk-in access to a variety of mental health services for those aged 12 to 25, will be part of the new Chigamik Waypoint Community Health Hub. The hub will be a one-stop support centre for youths struggling with any mental health issues including family conflict, stress, depression, anxiety, relationship issues and addiction. Waypoint, Chigamik and the Simcoe Muskoka LHIN Child and Adolescent Mental Health Steering Committee worked in collaboration with New Path Youth and Family Services, the lead agency for child and youth mental health services in Simcoe County, to file an application and acquire funding for the hub. Construction is well underway on the 40,000 square-foot joint health care centre, which will be located on Bayshore Drive in Midland. Local youth groups will provide input on designing the interior of the wellness hub, which will include Wi-Fi and access to information and resources to assist with various problems. Services will be provided to youths from North Simcoe (Midland, Penetanguishene, Tay and Tiny) as well as Springwater Township, and will also be available for both the Francophone and Indigenous communities. The entire facility is expected to be operational by December 2018. Franke Kindred designs bacteria-killing sink. Franke Kindred Canada has developed a sink which could drastically impact hospitals’ ability to limit the spread of bacteria and control infections. Engineers at the Midland facility, located off Highway 12 just west of Sainte-Marie among the Hurons, have designed the Medi-flo sink. It is equipped with an ozone generator, which adds ozone to the water to help kill bacteria. “For the health care industry, one of the biggest pain points is infection control within the hospital and the spread of bacteria that leads to infection,” said Shaun Desroches, Franke Kindred’s senior vice-president of sales and marketing. In Canada, every 157 seconds somebody acquires a hospital-associated infection and every 52 minutes somebody dies from that infection, according to Desroches. Franke Kindred engineers saw an opportunity to solve a very significant problem facing the health care industry. Six years ago, they set out to develop a sink which would limit the spread of bacteria. The Medi-flow sink has a few features which help with infection control. An off-centre drain and laminar flow tap helps prevent splashing, while an ozone generator adds ozone to the water to kill bacteria. Third-party research was recently conducted in order to give the sink some credibility and help the local company get it out to market. A study conducted by Dr. Curtis Donskey revealed that within two days of using ozonated water in hand washing sinks the bacteria within the sink strainer is killed and within nine days the bacteria in the drain is killed,” said Desroches. While the sink is great for new facilities, replacing sinks in existing facilities is a costly procedure due to decontamination costs. According to Desroches, it would cost around $15,000 to replace an existing sink in a hospital with a new Medi-flow sink. “We try to take a step back and look at it from a customer perspective and see what are the biggest pain points for our customers,” said Desroches. Instead of letting this deter them, local engineers designed a Ozo-flo faucet, which can be installed in existing sinks to add ozone to the water and help kill off bacteria. Hospitals Awarded for Birthing Program. Spring 2018, the board of directors for both Georgian Bay General Hospital and Orillia Soldiers’ Memorial Hospital were awarded the North Simcoe Muskoka Local Health Integration Network’s inaugural Award for Good Governance. The local health integration network's (LHIN) board of directors made the selection based on a nomination recognizing the work of both hospitals in developing the framework for their birthing partnership. The nomination specifically highlighted how the statement of principles led to the establishment of the Joint Birthing Program and how the foresight of the Orillia Soldiers’ Memorial Hospital (OSMH) and Georgian Bay General Hospital (GBGH) boards in establishing this governance framework has assisted both organizations in successfully operationalizing this initiative. The North Simcoe Muskoka LHIN board of directors recognizes how the collaboration and innovation involved in this birthing partnership improves the patient experience and care, and aligns with the patients first mandate to improve access to services and deliver integrated care. Through the Joint Birthing Partnership, patients have access to high quality care and the reassurance the birthing and gynecological services they need are available close to home. Through the program, GBGH provides services for low-risk births while OSMH provides care for higher-risk mothers and babies. The DMU 340 is a key piece of a significant capital investment plan that was spurred on by a $800,000 Southwestern Ontario Development Fund grant. The Province of Ontario supported Weber Manufacturing Technologies in the major upgrade, helping to create 17 new jobs, secure 220 existing jobs in Midland and boost production capacity by 30 per cent. 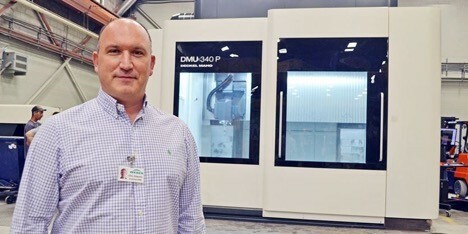 Weber stands out from the majority of mold making specialists by way of a secondary specialty — nickel vapor deposition (NVD) — that has helped it carve out a niche few other manufacturers in the world can claim. NVD enables Weber to fashion molds for unusually demanding, high-performance composites applications, including fine surface detail, grains and textures.